I have discovered a most wondrous thing. A few years ago I was looking for something new I could do with cabbage. I had half of a large head of it left over from something and didn't know what to do with it. I was also feeling the urge to make pasta, so I looked for recipes that had both cabbage and pasta. I found an eastern European dish called Haluska, which is basically just braised cabbage and onions with noodles. It seemed simple enough and I certainly had the ingredients so I decided to give it a try. And it was delicious. "Where have you been all my life?" delicious. The cabbage and onion cooks long enough to become tender and velvety and coats the pasta like a buttery velvet glove. What's the catch? The recipe calls for a stick of butter. That is half a cup. And while I love butter, that seemed like an awful lot of fat in general, and butter in particular. So the first time I made it I cut the fat in half and used equal amounts of olive oil and butter. Not having ever made the recipe as written I can't make a true comparison and I am sure it would be absolutely fantastically divine with the full stick of butter, but it was mighty darned tasty the way I made it. So tasty that I have made it fairly often since that first time. Any time I have any leftover cabbage, as a matter of fact. 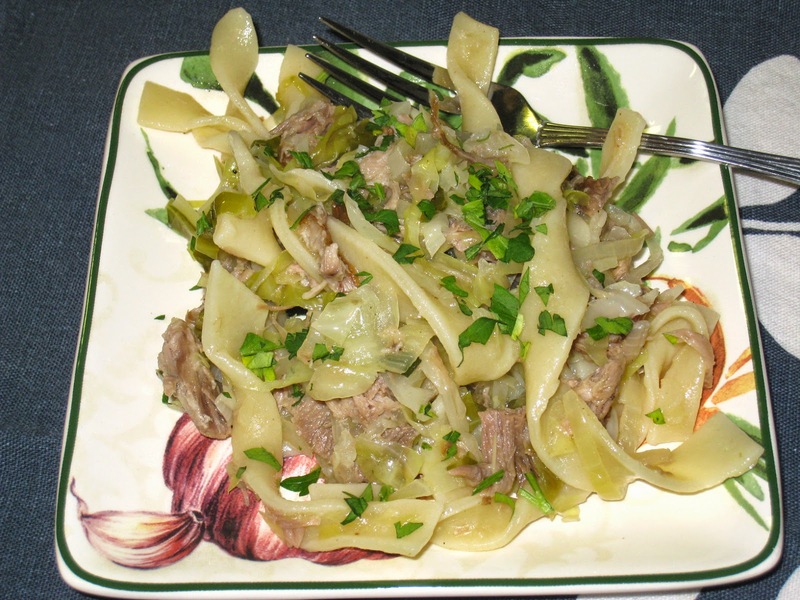 I usually make it with just the cabbage, onions and noodles, but many recipes offer variations that include meat. This last time when I decided to make it I remembered that I had thrown some braised pork shoulder in the freezer since I had cooked more than I could eat in a few days. I am always trying to reduce the load in my freezer so I decided this would be a good use for it. So I shredded up the pork and added it to the dish along with the noodles. And oh my gosh, what a wonderful thing that turned out to be! The meat melted into the dish like it was meant to be there, and while all of the flavors were detectable, they combined into something much much greater than the sum of its parts. It was heavenly. And I will be making it often. In fact, I now plan to always cook a little more meat than I need when I am braising so I can hold some back to make Haluska. For such an easy dish to prepare, it packs a powerful punch of flavor. Try it - I am sure you will agree! Melt the butter and 2 tablespoons olive oil in a large skillet over medium-high heat. Add the onion and cabbage and saute until they are translucent, about 10 minutes. Add the salt and pepper, cover, and reduce the heat to low. Cook for 15 to 20 minutes, until the cabbage and onions are translucent. Do not let them brown. Add the cooked noodles and meat if using and mix everything together. Sprinkle with fresh parsley before serving.